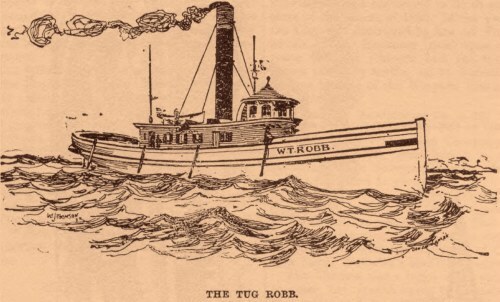 The W. T. Robb was built at Stromness on Lake Erie. to transport troops and prisoners. a local ship protecting the homeland. engines to put in a steambarge, the William Hall, and left her hull stranded off Victoria Park in Toronto as a breakwall. Not a fitting end for the fighting tug of the Fenian Raid. We should have been kinder to her memory. anyone who may look at my other sites. He is not the Capt. William Hall who stranded the Robb.